The European University Viadrina remains at the forefront of student exchanges with international universities. 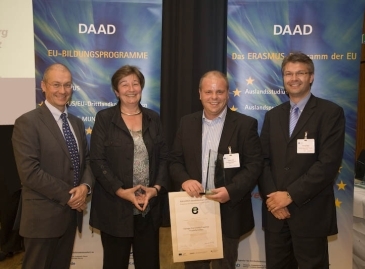 This year the Viadrina was honored for the second time with the Erasmus Quality Seal, “E-Quality”, which is given by the German Academic Exchange Service (DAAD). 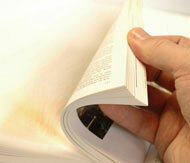 “E-Quality” is determined by a school’s service and accomplishments in the field of student exchanges. The Viadrina won first place among state schools nationwide for student mobility: 52% of Viadrina spend academic time abroad. While the percentage of outgoing Viadrina students choosing the most popular host countries, Spain (20%) and France (18%), is the same as at other German universities, the high percentage of students studying in Turkey (10%) and in Poland (9%) breaks notably from national trends. The almost 20% of outgoing students who choose universities in Eastern Europe is a distinguishing feature of the Viadrina. This year’s E-Quality Seal was awarded June 30th at the annual Erasmus conference in Bonn. Over 600 Viadrina students were asked about their satisfaction during the 2009 summer semester. The results show that ¾ of all students surveyed are very satisfied with their experience at the European University Viadrina. The quality and breadth of courses offered at the Viadrina, as well as the size of classes, were ranked as being especially satisfactory. As expected, assistance provided by instructors as well as student advising were also ranked highly. Likewise, 2/3 of those interviewed expressed satisfaction with the food in the cafeteria, although some desired better hours of operation. The results of this survey are in harmony with those of well-known rankings: users of StudiVZ (a popular German social networking website) ranked 170 universities in Germany, Austria and Switzerland - the Viadrina achieved ninth place, making it the best ranked university in eastern Germany. The Viadrina also achieved fifth place in a national survey regarding student satisfaction. In addition, Viadrina achieved top ranks in the CHE Ranking 2011 for its internationality and outstanding study surroundings. Students cited the good image, manageable campus and tuition-free enrolment as the main reasons for ranking the Viadrina so highly. Besides academic satisfaction, students were also asked about the university environment. This survey puts to rest the legend that all Viadrina students live in Berlin. In fact, most of the Viadrina’s Business Administration students and as well as Law students live in Frankfurt (Oder) and praise the little city’s optimal conditions for learning. This is also reflected in the satisfactory reviews the Viadrina’s student housing and general living conditions received from more than half of the students surveyed. Additionally, the availability and modern features of student housing as well as of privately leased apartments in the city received high marks, especially with regard to price.